How do I adjust the point value for an entire quiz using fudge points in SpeedGrader? 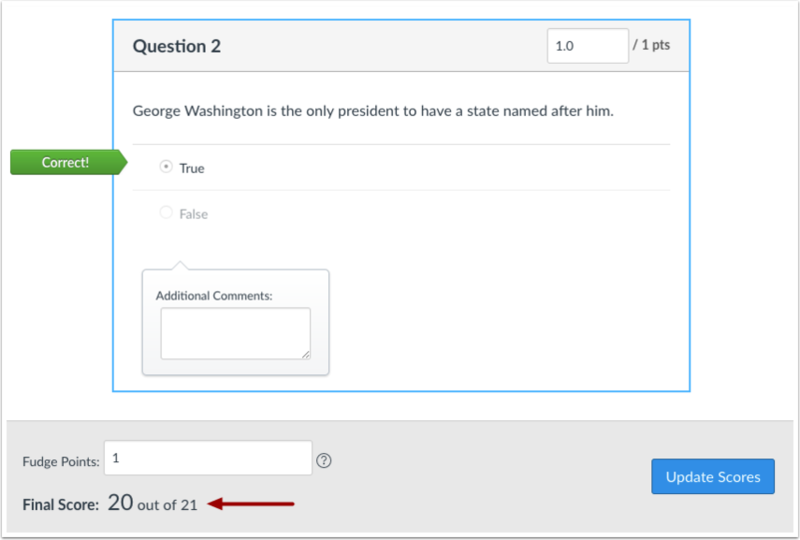 Fudge points allow you to manually add or remove points from a student's overall quiz score. This feature is only available in SpeedGrader. 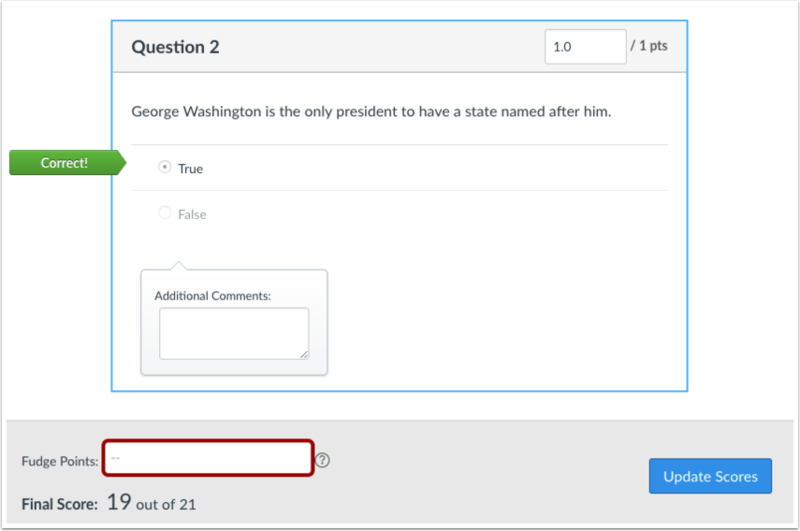 Note: If you want to adjust points for a specific question within the quiz, you may want to use the quiz regrade feature. Click the name of the quiz you want to open. In the sidebar, click the SpeedGrader link. 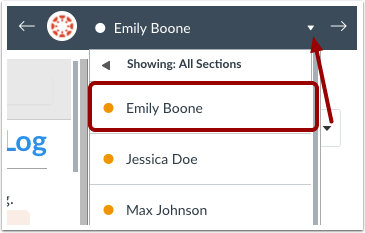 In the Student drop-down menu, select the name of the student whose quiz you want to view. In the Fudge Points field at the bottom of the window, enter the number of points you want to add to the overall quiz score. You can also enter negative points. The Final Score area will show you what the final score would look like based on the number of fudge points. 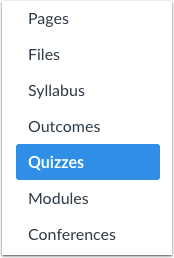 When you are ready to change the student's quiz score, click the Update Scores button. 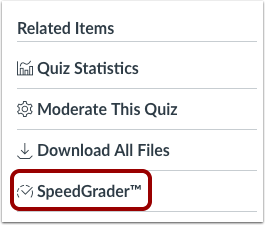 Previous Topic:How do I grade quiz questions in SpeedGrader? 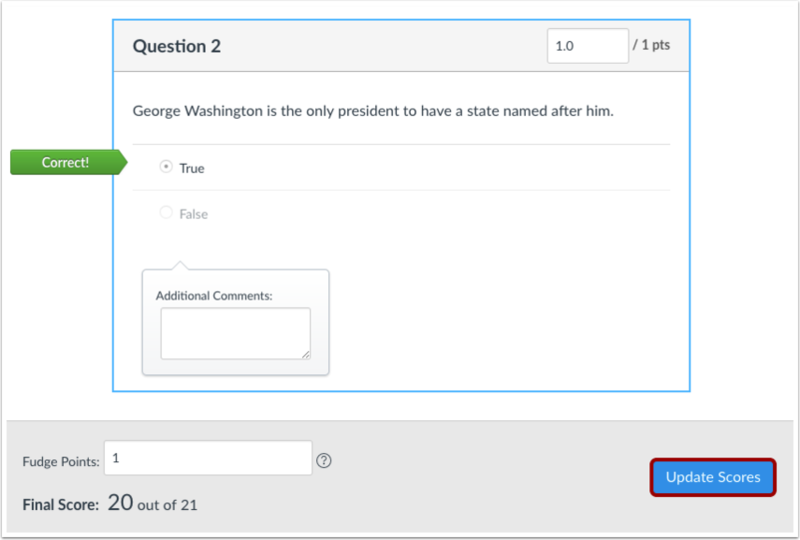 Next Topic:How do I grade one quiz question at a time in SpeedGrader? Table of Contents > SpeedGrader > How do I adjust the point value for an entire quiz using fudge points in SpeedGrader? Re: I would like to know if it's possible to make a question "no count" after the students have taken the quiz?